Studies into the relation between subjective perceptions of individuals and objective economic conditions have usually resulted in ambiguous empirical findings. 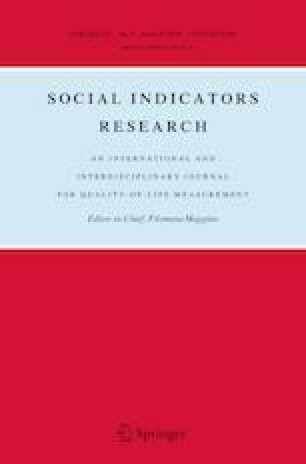 Whilst most studies perceive subjective welfare as being operationalized by indicators of happiness or life satisfaction, we narrow the approach to an economic domain of subjective well-being—perceptions of poverty. We argue that our approach better reflects the economic dimension, as the former may include numerous non-economic domains. We use a case study of two countries—Czechia and Slovakia—which underwent early economic transition as a common state in 1989–1992, then became independent states in 1993, after the dissolution of Czechoslovakia. We base our findings on three historical data sets covering a period from around the end of the communist era to the early years after the split, and recent data from EU Statistics on Income and Living Conditions (2005–2016). Despite initially small differences in subjective poverty levels in socialist Czechoslovakia, a considerably larger drop in economic performance during the transition period in Slovakia than in Czechia resulted in a sharp widening of the subjective poverty gap. The recent data suggests that, despite a high degree of actual economic convergence of Slovakia and Czechia, the gap in subjective perceptions of poverty is declining at a remarkably slower pace. 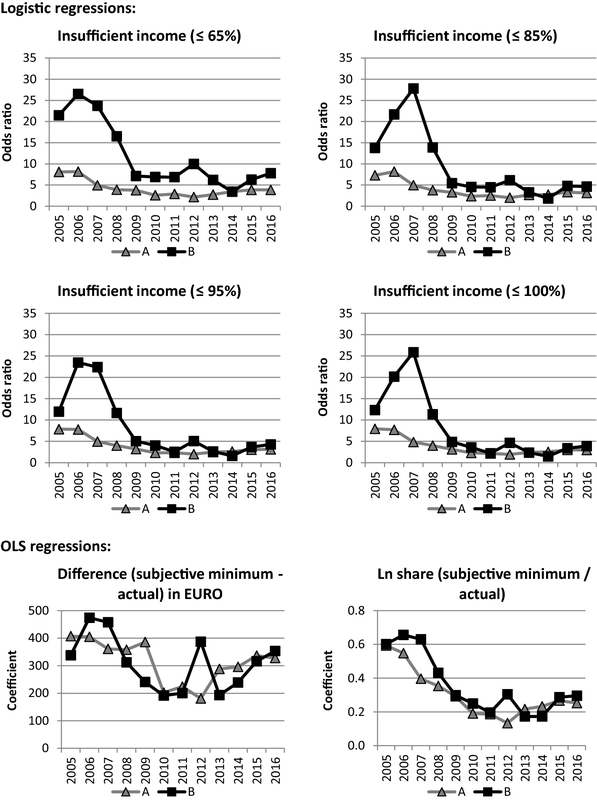 We argue that relatively fast economic growth is not necessarily associated with a commensurate decline in subjective poverty perceptions. Our results thus support the Easterlin Paradox, although we substitute happiness by an economic dimension of subjective well-being. This work was supported by the European Regional Development Fund—Project “CSDA Research” (No. CZ.02.1.01/0.0/0.0/16_013/0001796) and by the Slovak Scientific Grant Agency (VEGA 2/0002/19). Tomáš Želinský further acknowledges support for visiting the Institute of Sociology of the Czech Academy of Sciences financed within the Protocol on cooperation in the field of education, youth and sports between the Ministry of Education, Science, Research and Sports of the Slovak Republic and the Ministry of Education, Youth and Sports of the Czech Republic. The EU-SILC datasets were made available on the basis of Contract No. 265/14 between the European Commission, Eurostat, and the Institute of Sociology of the Czech Academy of Sciences. Thanks for additional data information go to the Statistical Office of the Slovak Republic and the Czech Statistical Office. The authors especially wish to thank Andrew Clark, who provided valuable comments and ideas as a discussant of this paper at the IARIW 2018 General Conference. The authors would also like to thank the anonymous reviewers for their helpful and constructive comments which substantially contributed to the overall readability of the final version of this paper. Responsibility for all conclusions drawn from the data lies entirely with the authors. Spatial distribution of mean wage, GDP, insufficient income and inability (NUTS2 regions), 2015–2016. Notes: Maps were created using (c) EuroGeographics for the administrative boundaries “NUTS 2013” shapefiles. Stiglitz, J. E., Sen, A., & Fitoussi, J.-P. (2009). Paris: Commission on the measurement of economic performance and social progress. https://ec.europa.eu/eurostat/documents/118025/118123/Fitoussi+Commission+report. Last accessed November 2018.